Laugh, Sip, Paint! Are you looking for something fun to do in Auburn, AL? Or, maybe you've always wanted to learn how to paint. Either way, you are going have a great time at our painting classes in Auburn. Bring a friend, a sense of humor and your favorite beverage and snack. We provide all of the painting supplies (smocks, brushes, easels, canvases and everything in between) and our talented instructors will guide you step-by-step from blank canvas to your completed masterpiece! We also host private parties for kids or adults. Looking for something fun for a group? Book a fun and exciting painting party in our Auburn/Opelika studio! Conveniently located between TigerTown and Sams Club on Frederick Road, our studio can accommodate most groups, small and large. Birthdays, reunions, showers and church or office gatherings are just a few of the reasons to enjoy having fun and participating in a painting party. Best of all, these parties are fun for everyone, young and old, and absolutely no experience is needed for our painting classes. Bring a cake, snacks, and drinks for everyone. 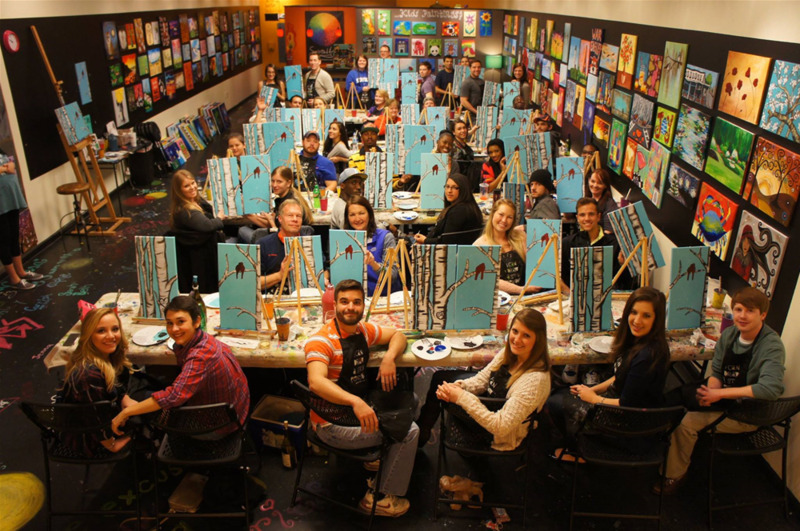 You'll have great time in Auburn at your very own painting party. Every year, starting in June, we offer a variety of summer camps for kids ages 5-12. Each summer comes with brand new paintings created just for our campers! Our camps are designed for kids to have loads of fun while learning about the basics of painting. A talented instructor walks the kids through the paintings, step-by-step. At the end of the camp, the kids leave having made new friends and paintings they can be proud of! Want to see all the events we are currently offering? Click here.